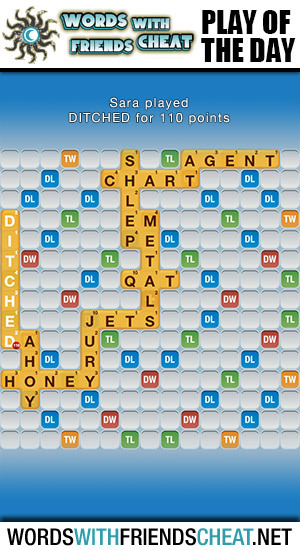 Today’s Words With Friends – Play Of The Day is DITCHED (110pts) and was submitted by Words With Friends Cheat user Sara. In this ambitious play Sara found the best possible placement for her word; right on top of two triple letter tiles and a triple word tile. She also used all seven letters in her rack which earned her the thirty five point bonus! a. to get rid of: I ditched that old hat of yours. b. to escape from: He ditched the cops by driving down an alley. c.to absent oneself from (school or a class) without permission or an acceptable reason.